North Texas may not have mountains but it does have a variety of terrain and soils. So why are we discussing landscape in our newest Behind the Tracks post? Because the geography of the region influences the Cotton Belt design and construction process. Why Does Geography and Geology Matter? Building a regional rail line like the Cotton Belt is a huge undertaking; especially since the train’s tracks will span over 26 miles traveling through six different cities. That means DART will have to account for different geological features and soil types. Along the corridor, most soils have moderately to severely restrictive conditions, which can shrink and swell just like how some home foundations in north Texas are affected by shifting soils. These conditions will affect how DART constructs the track, bridge foundations, and station platforms. DART will also have to design bridges for several stream crossings and over the Elm Fork of the Trinity River, which have different underlying geology than other parts of the corridor. 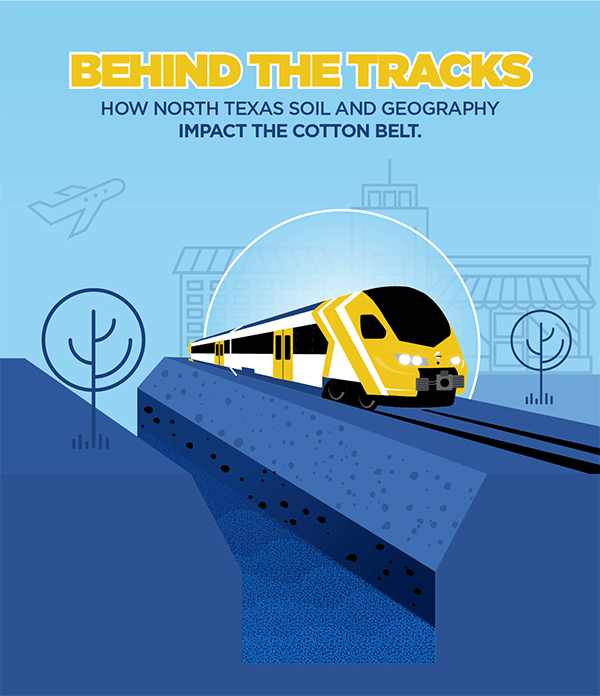 DART will continue to study the Cotton Belt corridor, and is developing an Environmental Impact Statement (EIS) to identify existing physical and natural conditions along the corridor, and the potential impacts and benefits of the Cotton Belt. This EIS will provide DART with critical information on the potential issues that may affect design and construction of the project, as well as outline how DART can mitigate potential impacts to the community and the surrounding environment. What’s Next for the Cotton Belt? DART is continuing to develop the Draft EIS in collaboration with its federal partners, the Federal Transit Administration (FTA), the Federal Railroad Administration (FRA), and the Federal Aviation Administration (FAA), while providing regular updates to the DART Board of Directors. An Administrative Draft EIS will then be reviewed by FTA, FAA, and FRA. Once the Federal agencies have reviewed it, DART will publish the document and collect comments during a 45-day period. DART will then compile comments and prepare the Final EIS. Getting all the necessary information matters when pursuing projects as large as the Cotton Belt. Understanding what is going on along the corridor before we start building, can ensure that the Cotton Belt remains safe, sustainable, and solid for future generations.